One ought, I think, to be suspicious of films about mental illness. They nearly always call on us to pity and thus to condescend to their characters. Such feelings are not those elicited by great art, which requires us to recognize in the characters an essential likeness to ourselves. 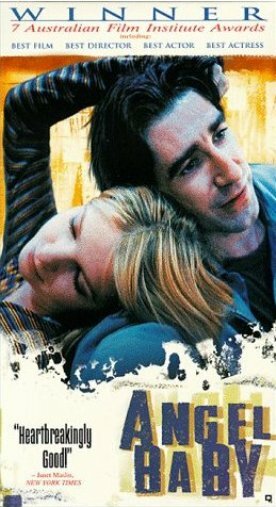 But Angel Baby by Michael Rymer, like other recent (and good) Australian pictures such as Shine and Cosi, treats mental illness as a metaphor for universal experiences. Rymer makes the schizophrenia of Harry Goodman (John Lynch) and Kate Deier (Jacqueline McKenzie) almost irrelevant to their story, which is about love and purpose and the sense that love gives us all of being somehow chosen and favored by God—and maybe of being crazy too. Harry wakes up tied to the bed posts. Kate is not there. Harry begins to panic. He calls out to her. She comes back from the kitchen. “This is not funny,” he says, echoing her. But for her it is very serious too. She makes him swear that he will be hers until he dies, which he does, affectionately calling her “you nutter.” But then she still will not untie him until he also drinks a love potion she has prepared—” to make sure.” The reason for these pre-cautions is that she is pregnant. Again they have a pow-wow with the doctors and Morris and Louise. No one else is very happy about the pregnancy, but Harry and Kate are determined to go through with it. And not only to go through with it but to go off their medication, lest the baby be born with it in her system. At the same time, Kate refuses to see a doctor. Part of her illness is a horror of being cut open and of losing blood. It is one of several psychotic obsessions which begin to resurface in the absence of medication. Other things begin to go wrong. When “Wheel of Fortune” goes on hiatus, it is as if God, or his angel, has withdrawn from their lives, leaving them frightened and alone as they cope with a dangerous pregnancy. I didn’t like the ending. It came as a reminder that madness is not just a metaphor but also a real thing. And two schizophrenics who in real life decided to stop taking their medication and have a baby, which they planned to raise themselves, would be behaving very irresponsibly indeed. But it is only at the end that this reflection interferes with one’s enjoyment of this splendid little film.